As we continue our Seniors and Surgery series, let’s take a closer look at the Carotid Endarterectomy. Roughly 140,000 of these procedures are performed every year in the United States, the vast majority in patients over the age of 50. Why would someone need a Carotid Endarterectomy? 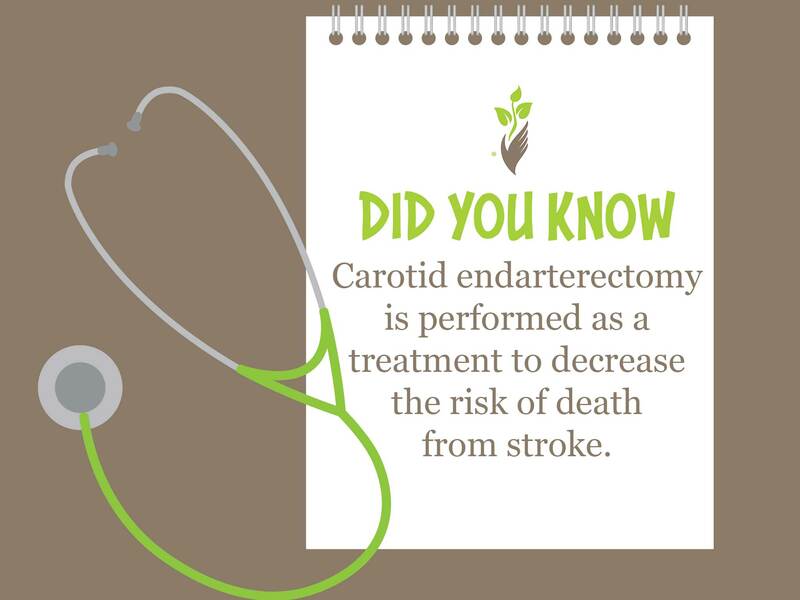 Carotid endarterectomy is performed as a treatment to decrease the risk of death from stroke. The carotid arteries in the neck are the dominant blood vessels supplying precious blood flow to the brain, your most important organ. Over time, plaque can build up within the carotid artery, causing narrowing of the vessel. This narrowing, called carotid artery stenosis, increases one’s risk of having a stroke. Let’s say that you experience temporary weakness of your right arm that resolves after a couple of hours. You go to the emergency room where doctors diagnose you with a transient ischemic attack (i.e TIA, or ‘mini-stroke’). At some point, you would obtain an ultrasound of your carotid arteries. If there is significant narrowing, you very well may find yourself on the other side of the exam table talking with a vascular surgeon about undergoing the carotid endarterectomy. There are a few very important things to know about the carotid endarterectomy procedure. First, different surgeons have varying approaches to anesthesia. In some cases, the procedure is performed under general anesthesia in which you are completely asleep. Other surgeons prefer to have the patient awake and use a nerve block and local anesthesia (i.e. numbing medicine injected through a small needle). One approach is not necessarily better than the other, and the awake method is usually tolerated very well. Nevertheless, as you can imagine, this topic should be discussed beforehand with your surgeon as you do not want any surprises on the day of your surgery. Another very important detail is regarding the particular risks of this procedure. Every surgery carries some general risk of infection, bleeding, reaction to anesthesia, etc. However, because this surgery involves removing plaque from the carotid artery, there is a small chance that a piece of this plaque could break off during the procedure, travel to your brain, and cause a stroke during the procedure. You want to find a surgeon who keeps track of his or her ‘stroke rate,’ and can tell you with honesty and confidence that there is a 1-3% risk of perioperative stroke. If someone quotes you a higher percentage or doesn’t know his or her peri-procedural ‘stroke rate’, it is best to move on and find another surgeon. Additionally, you should not be afraid to ask how many carotid endarterectomies he or she has performed. Research has consistently shown better outcomes from surgeons who perform this procedure more routinely and in high-volume medical centers. While each individual is different, you should expect to be away from work or your normal activities for at least 3-4 weeks as a general rule of thumb. Immediately following surgery, you will be admitted to the hospital where your doctors will keep a close watch on your blood pressure, as tight control is needed over the first 24 hours to prevent complications. Once your blood pressure is under control and you are able to tolerate some small meals, most patients will be able to go home between 24-72 hours following surgery. It’s important to keep in mind that you will not be able to drive for several weeks following surgery. In order to operate a vehicle safely, you must have the ability to react and rotate your neck side to side in order to see crossing vehicles or pedestrians. During the healing process, there will be some pain or tenderness in your neck that will restrict your range of motion for a few weeks. If you live alone or don’t have access to public transportation, it will be important to plan ahead to make sure you have the necessities in place (i.e. ride home from the hospital, help with grocery shopping, etc). It is understandable that anyone facing surgery on his or her carotid arteries may be nervous or apprehensive. This is a normal reaction and you have the right to have all of your questions or concerns addressed before making a decision about surgery. Carotid endarterectomy has been shown again and again to be a very successful surgery in which the benefit far outweighs the risk for the appropriate patient at high risk of stroke. As always, ask around and find an experienced surgeon in whom you can place your trust. And if you need help during the recovery following surgery, don’t hesitate to reach out to Preferred Care at Home to see how we can help with transportation, meal preparation, medication reminders and more while you make a strong recovery.